NOTE: This route can also be shortened, if you're not feeling up to the distance covered here: just turn it into an out-and-back along the Champs Elysées. 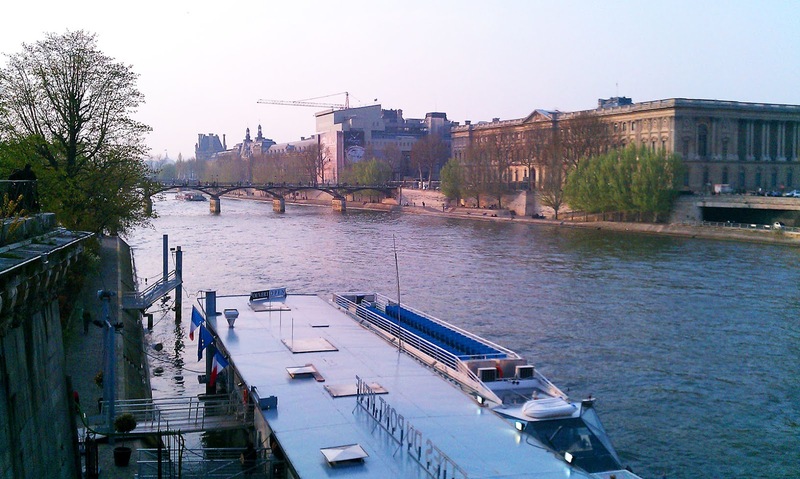 Or if you just want to stay along the river, try the Seine Riverside Run link below! This route is what I consider the classic loop through the heart of Paris, the most elegant city in the universe. The route takes-in a lot of the most interesting sights around the Seine riverfront: the Louvre palace and museum, the Tuileries park, the Champs Elysées, the Arc de Triomphe, the Eiffel Tower, and the elegant buildings and bridges along the Seine River. The run starts at Pont Neuf (New Bridge), which is really Paris' oldest existing bridge, in the heart of town. 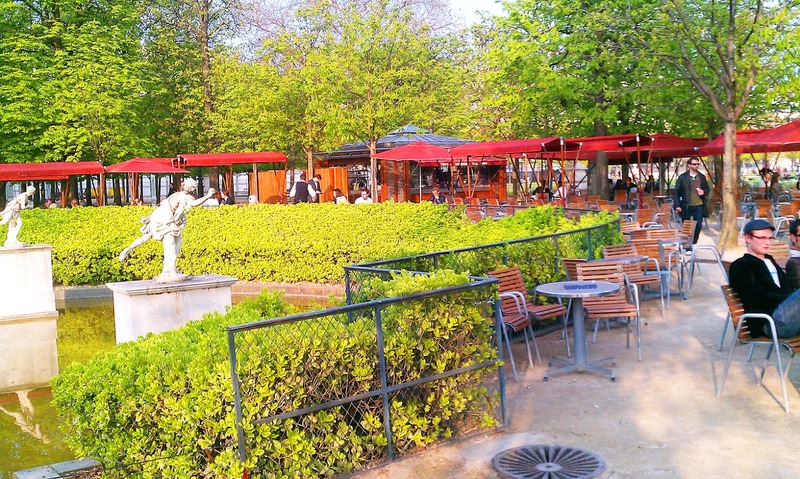 It joins both sides of town through the Cité island, and is easy to get to by the Metro. If you stand on the bridge, looking westwards towards the Louvre and beyond, this is the basic direction that we'll be running. Looking at the statue of Henry IV on his horse, turn right and run northwards to the right bank, then turn left and run westwards along the Seine riverside, towards the Louvre. You will pass the row of booksellers with their green boites or boxes set up along the embankment. Now, turn left to run through the palace's front entrance and you come out into the big, square courtyard. 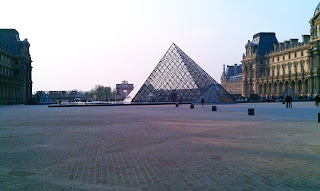 Continue straight ahead, through the next archway, and you can see the glass pyramid of the Louvre museum beyond, whose entrance is underground, beneath the pyramid. 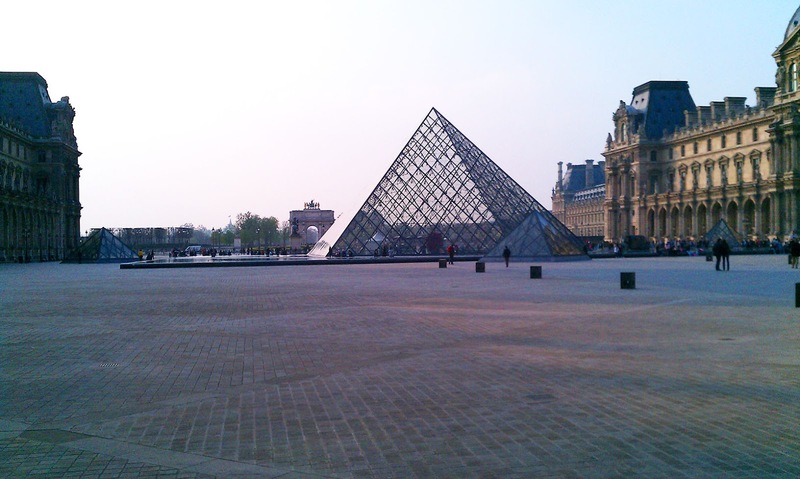 NOTE: If you're in Paris on a work trip, the Louvre is open until 10 p.m. on Wednesdays. It's amazing collections are worth it: the Mona Lisa, the Venus de Milo, Dutch Masters, antiquities from Egypt, Greece, Rome, much more than you can take in during just one visit. Keep going straight, westwards, through the smaller, older Arc de Triomphe (Napoleon built the much bigger one (Etoile) later to celebrate his increasing ego). 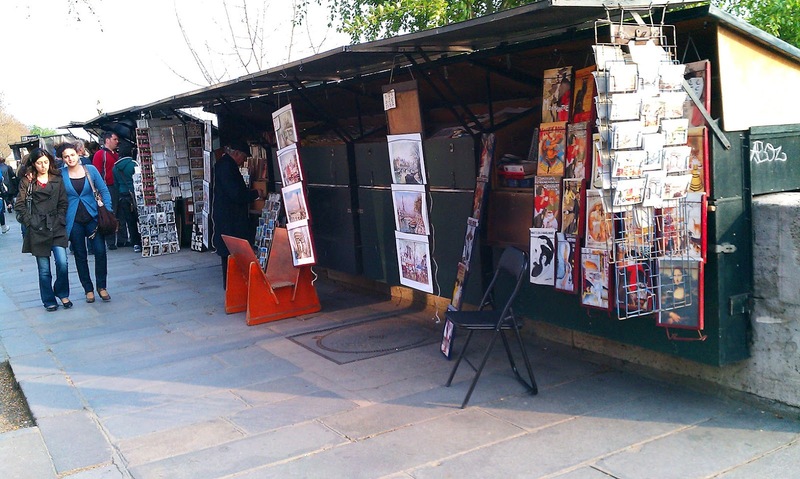 Cross the street and you're at the entrance to the Tuileries gardens. If it isn't evening, when the gates are closed, run straight through the park, past the statues, flowers and cafés. NOTE: If you get there after the gates are closed, you have to run around the park, either around the left or right side. I prefer the left, along the Seine, where you can see the elegant Musee d'Orsay across the river, and the constant parade of tour boats. After the gardens comes Place de la Concorde, with its obelisk, fountains and the ship-shaped streetlamp posts. Cross the square on the right side and keep going straight towards the bigger Arc de Triomphe in the distance. You are now on the Champs Elysées. This part of the street is a tree-lined boulevard, bordered by parks. On the right side is a nice park for sitting and watching the flowers, with cafés and theaters mixing it up. Across the street, the park is a bit lonelier, but sometimes very entertaining: I've seen it full of french-horn players a few evenings, where they were all playing varying mixtures of solos and group-efforts in a merry chaos of hunting music. On the right, you'll pass the backside of the Palais de l'Elysée, home of the French President. When you hit the big traffic circle at Place Roosevelt, Champs Elysées transforms itself into the famed shopping street, lined with boutiques, cinemas, restaurants and lots of streetlife. 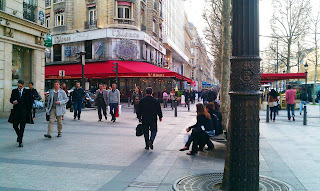 The street goes uphill a bit here until you get to the pinnacle at the gigantic Arc de Triomphe (Etoile). You can take the tunnel around the back side to get there under the many lanes of traffic, and even go up to the roof, if you like. The route now goes off to the left, so cross several of the streets fanning out from the arch, to get to Avenue Kléber to the left. (That's how this gigantic traffic circle got its name as "Etoile" or "star", from the streets radiating from this spot.) 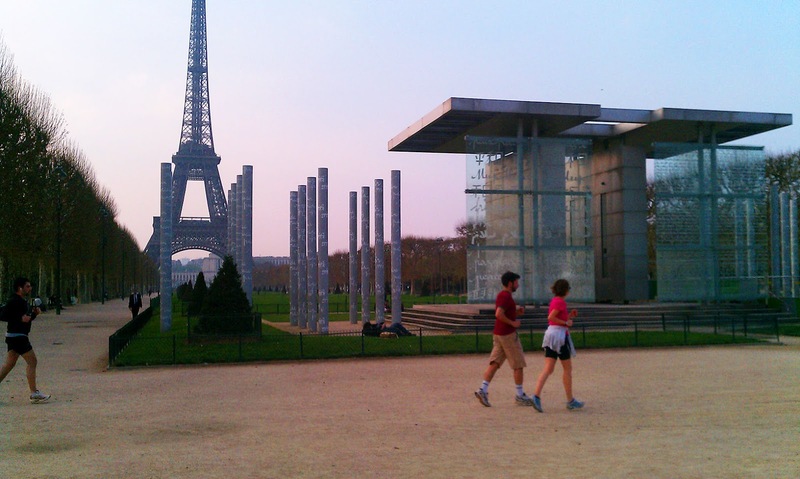 Now run straight down Kléber for 1 kilometer, taking you directly to the Trocadéro, a modern museum complex on a hill across the river from the Eiffel Tower. 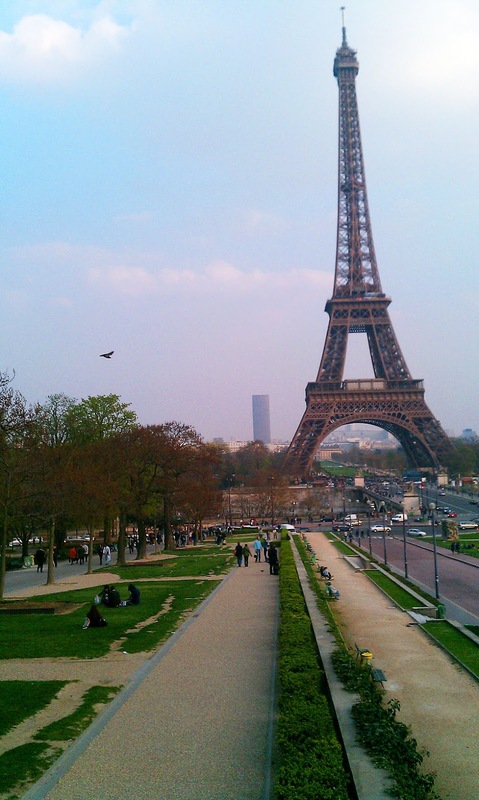 Make sure you run out to the raised terrace above the Trocadéro park for a great view of the Eiffel Tower. It's especially impressive in the evening when the tower's strobe lights are turned on, every half hour. Run towards the tower through the park, then cross the bridge over the Seine to the tower. The place is overrun by tourists and even more so, nowadays, by African trinket sellers. I must have had to zig-zag around a hundred on my last run. 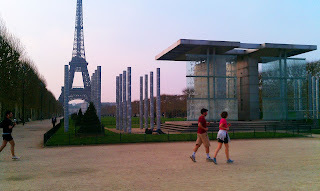 Run under the tower and out through the Parc du Champs de Mars, towards the military academy straight ahead, the Ecole Militaire. Turn left (north) when you get to the school (ironically, there is a peace monument there), and run straight out Avenue Picquet to the next big intersection, at Avenue de Tourville, and turn right. 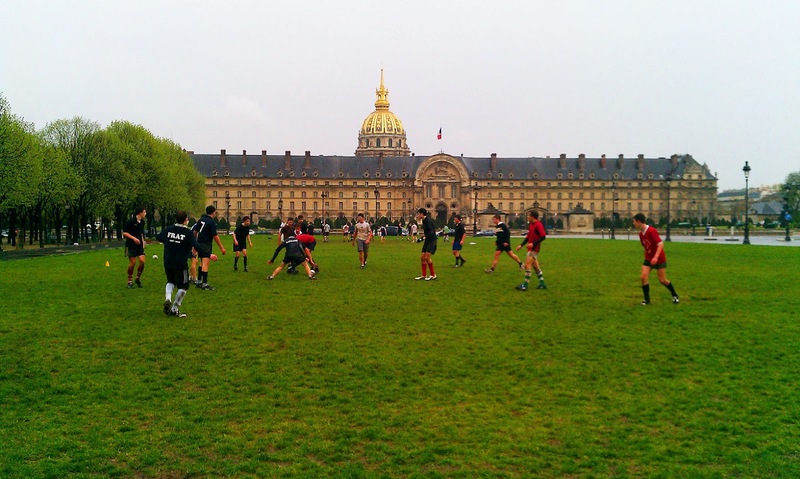 You are now running eastwards towards the amazing gold-domed Invalides, a veteran's hospital from the 1600s. 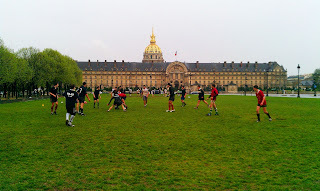 Run past the front side of Invalides, with its moat, then turn left on Boulevard des Invalides to run along the east edge of the complex, heading north again. Behind the main building, a park opens up to the river, where you can now run through the park until you get back to the Seine. 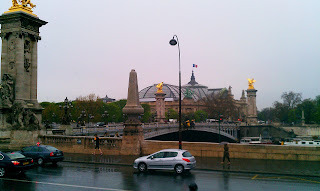 You arrive at the beautiful Pont Alexandre III bridge to your left. Paris has, in my opinion, the most beautiful collection of bridges anywhere, and this one is maybe the most impressive. Pont d'Alexandre III on a rainy evening: still looks impressive! Now just turn right and run with the water to your left side all the way back to Pont Neuf. You'll pass, among other things, the French National Assembly (House of Representatives), the elegant Musée d'Orsay impressionist art museum (in an ex-train-station) and the French Academy of Sciences. You can't also help noticing the last bridge before Pont Neuf, a small pedestrian bridge, the Pont des Arts, going across to the Louvre from the Academy of Sciences. This is a favorite meeting place and hangout for young people every evening, filled with picnic spreads and wine bottles, with a beautiful view of the river and the surroundings. 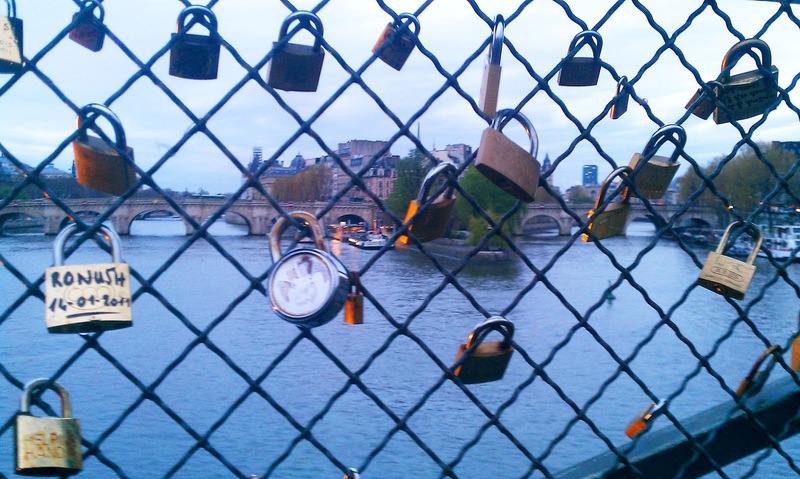 Tourists have taken to hanging padlocks on the bridge railings in recent years. Just a couple of minutes later, you're back at Pont Neuf. Voila! Wau! Going to Paris tomorrow and this route sounds amazing! Keith - I just ran this loop. My most beautiful run ever. Paris is such a beautiful city! Thank you for sharing this. how long does this take? i would like to use this route as a 'walking' tour when i visit in oct.
Well, as most people walk about 5km per hour, and this route is 11.6km long, it should take you over 2 hours to do, not counting all the pauses you'll take to view so many amazing Parisian sights. Have fun in Paris! Ken, I can't wait to run this route in a few weeks when I'm visiting Paris for the first time. Thank you for generously sharing this. Sounds perfect.